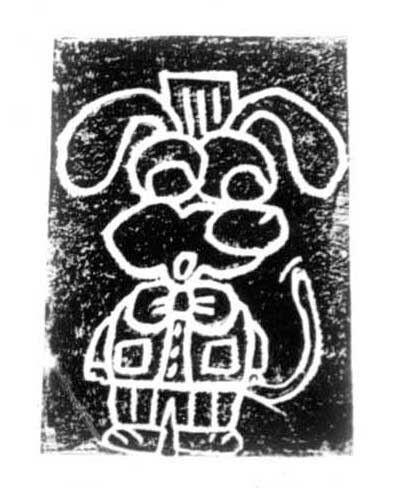 Many years ago I did a printmaking project in an underprivileged school. 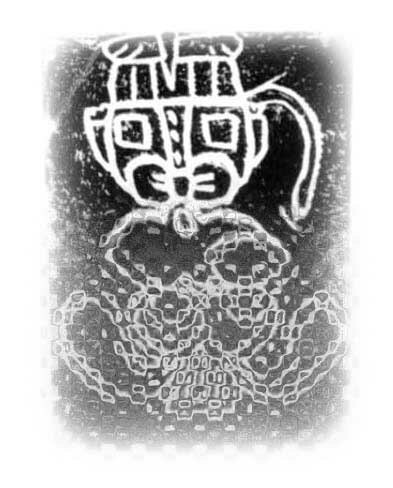 One of the students made a print of (what I thought was) a Central or South American religious deity. I was intrigued with the clay pots or were those drums? How surprising that a cute, cartoon dog (or mouse), when reversed, depicted such an altogether different creature. Nothing about the ‘accidental’ image reflected the student’s cultural environment. Than are dreamt of in your philosophy” … wonderful example. A perfect example of the universe’s relationship between opposites which calls for human respect, wonder, and creative interpretation: all of which you have supplied in this stunning piece. I’ll be honest and say that your interpretation is far beyond what I ‘consciously’ intended or thought. Far more elaborate and insightful. But it aims me in the direction of thinking about the relationship between opposites and what that calls for. And calls forth. It’s very human what you are saying the ‘seeing’ begins or envelops. That is wonderful – there is such a different world in things the ‘wrong’ way round. The image is stunning upside down, with complex and obscure stories within. I often turn my paintings and they take on a whole new character seen from another point of view. I do that too Anna. Turn paintings upside down and/or look at them in a mirror from different angles. Interesting how synonymous looking in the mirror and upside down can be in terms of revelation. I like the way you portray the images, the first one especially is beautiful. At first glance, I perceived an upside down dog or cat quite clearly. Your initial perception of a religious deity or drums, and possibly whatever else you ‘saw’, allowed me to see these too. I study my naive drawings/paintings from all sides, perhaps I will uncover something that was hidden from me on a known level, to be discovered with alternative sight. Your example tells me that what we see on the surface, is a projection of what we know, what we are used to seeing, and what at first was hidden, is what it might become. In balance, we strive to know both, to be both. I hope this makes sense, I’m still working it out. Yes it makes perfect sense. And the sequence of ‘what we know’ to ‘what mght become’ is interesting both visually and in other realities perhaps employing the visual metaphor. What is that saying about we see the world we are? Something along those lines. Now I feel like spending more time with (particularly) my drawings. Thank you everybody for these replies and observations and comments. I found this ‘reality’ of this twin image amazing and your thoughts have added a new dimension. You’ve ‘grown’ my understanding. Yes, it is surprising what we say through our written words and drawings, as if there is something else working in us on a deeper level, waiting to be unraveled. This has happened to me on occasions, and always astonishing. That’s true isn’t it mn. And jokes seem to work the same way. In the visual art we sometimes work so quickly transforming works to get them ‘where we want them’ it seems we may also be (to be metaphorical) washing away eons of cave painting. Layers on layers. And you bring up a really good point with this quote about words. Our writing/ and expressing what we see and perceive/ gives birth to an entirely new reality. Leading to the thought of sub-atomic particles being ‘aware’ of being observed and behaving differently. Now imagining self (and manifestations such as ‘art’) as the ‘observed’ and responding. Playing with this thought a bit. Fascinating. I remember being in a drawing class once where the teacher had the model hang her head back and down over the edge of a table so we could draw her face upside down. Of course, the model was pretty uncomfortable, but the drawings were accurate and full of humanity. The lesson was that our representation of “reality” is based on preconceptions. We don’t usually draw what we see, but what we think we ought to see. The upside-down face is newly presented and must be drawn “from life”. That’s a very interesting drawing activity. It fits in with the book ‘drawing on the right side of the brain’ where the author has designed activities to ‘subvert or trick’ the judgemental (left) side of the brain. Drawing upside down (the image not the artist) allows perception to more accurately register. Totally true about drawing what we think we ought to see. I wonder too with our own art if we are creating from preconceptions. That’s a wonderful discovery. Another sort of life just hovering upside down. As you suggest, each one with its own unique character. It reminds me of an image in a book I owned as a child. I found it intriguing, and a revelation too. ‘Life hovering upside down.’ That’s nicely said. Your children’s book recollection inspires images of things that are like Janus or even hourglasses. Fascinating. It looks more intentional and legible as an image the “wrong” way up. Something was trying to break through. You may very well be right Richard. Something wanting to break through. You may very well be right. I think maskednative above alludes to this possibility & as Karen says ‘another kind of life hovering upside down.’ Interesting you see it more readable the wrong way up. And yes fascinating from a 12 (maybe 11 or 10, I can’t quite remember) year old with no exposure to art or travel experience.